This was absolutely delicious. Really simple to make and lovely and comforting. Bring a pan of water to the boil, add the orzo and cook for about 10 mins until just tender. Drain, but reserve a mugful of the cooking water. Tip the pasta into a warmed bowl, toss with 1 tbsp olive oil and 2 tbsp cooking water, then cover with clingfilm. Heat 1 tbsp oil in the pan and add the onion. Cook, stirring often, for 6-7 mins. Stir the garlic into the onion, add 2 tbsp of the orzo cooking water, cover, reduce the heat and cook for 10 mins. Stir in the saffron, and then the peppers. Quarter the tomatoes and blitz them into passata. Pour this into the pan. Simmer for a few mins until juicy, but not too wet. Mix in the drained pasta and turn off the heat. Stir the olives and parsley into the pasta. 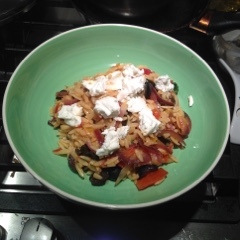 Serve topped with a few tsp of goat’s cheese.